The Brain Physiology and behavior: Localization of function Explain one study related to localization of function in the brain. Examine one interaction between cognition and physiology in terms of behavior (Evaluate two relevant studies). 3 In general…. If there is a bump or protrusion in that area it indicates MORE of that ability or trait. 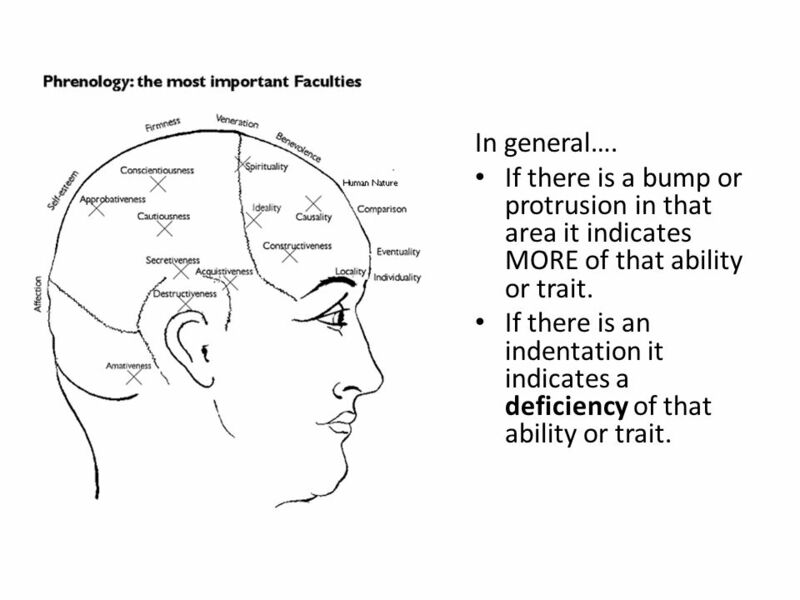 If there is an indentation it indicates a deficiency of that ability or trait. 4 Phrenology? Do you think it is a valid science? 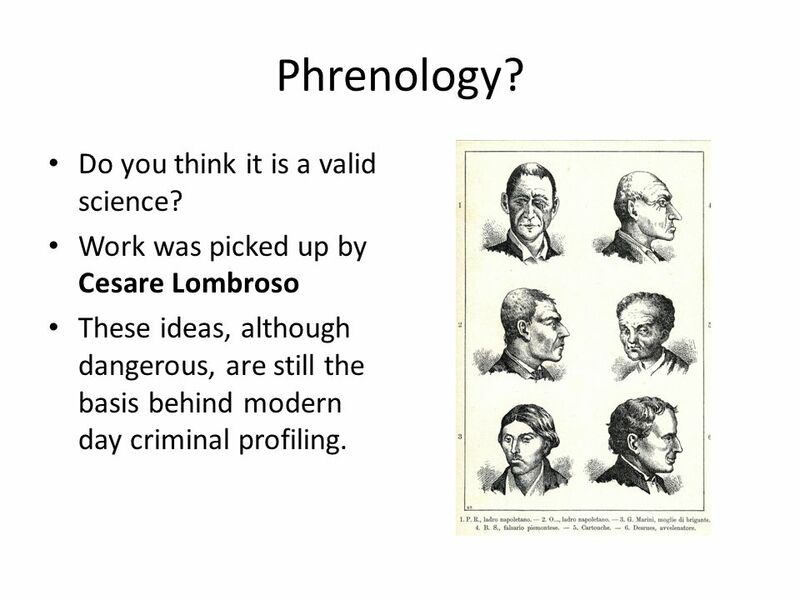 Work was picked up by Cesare Lombroso These ideas, although dangerous, are still the basis behind modern day criminal profiling. 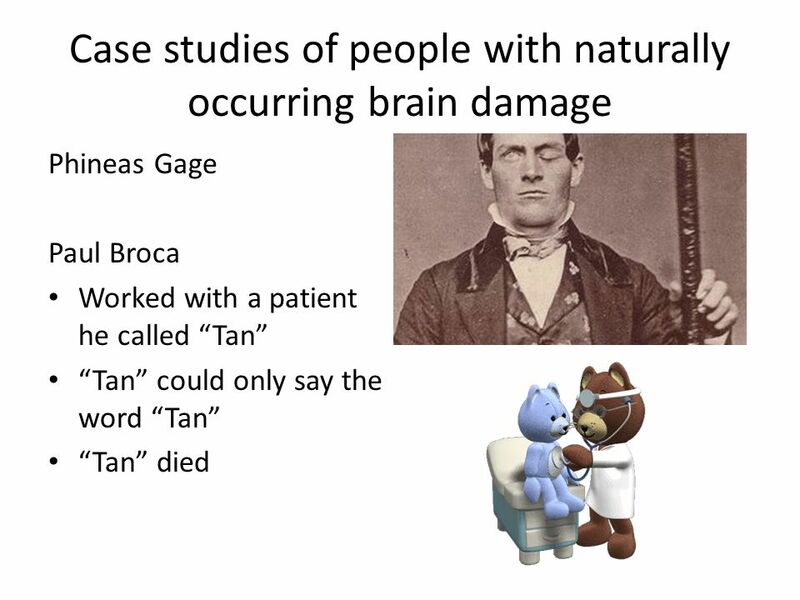 6 Broca’s Area In post-mortem autopsy, Broca found damage in the left frontal area of Tan’s brain. 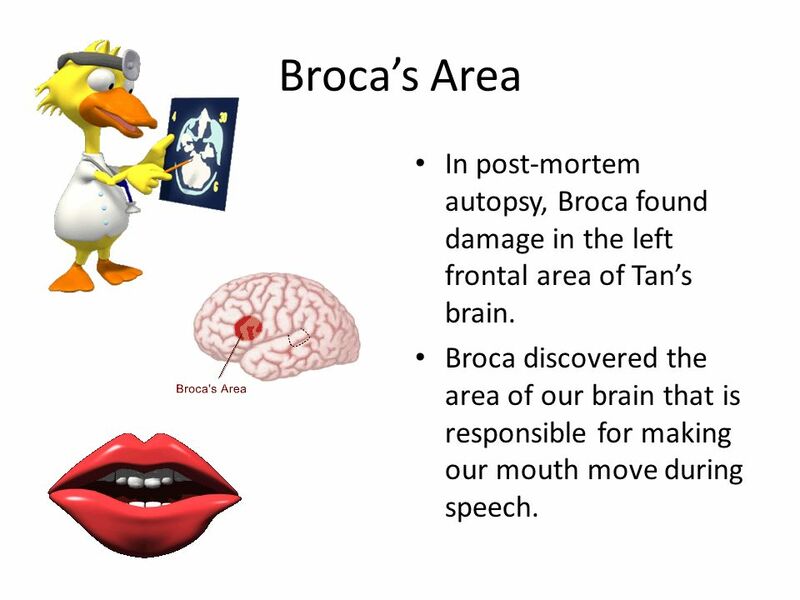 Broca discovered the area of our brain that is responsible for making our mouth move during speech. 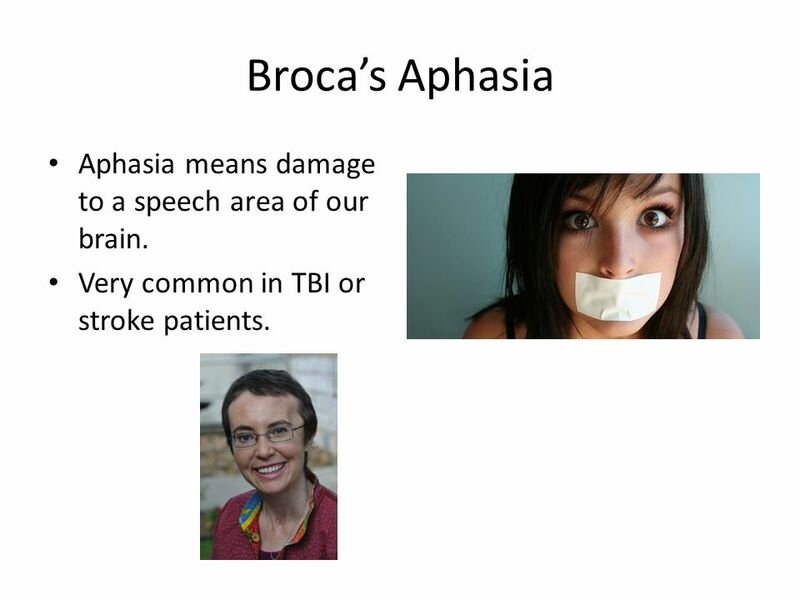 7 Broca’s Aphasia Aphasia means damage to a speech area of our brain. 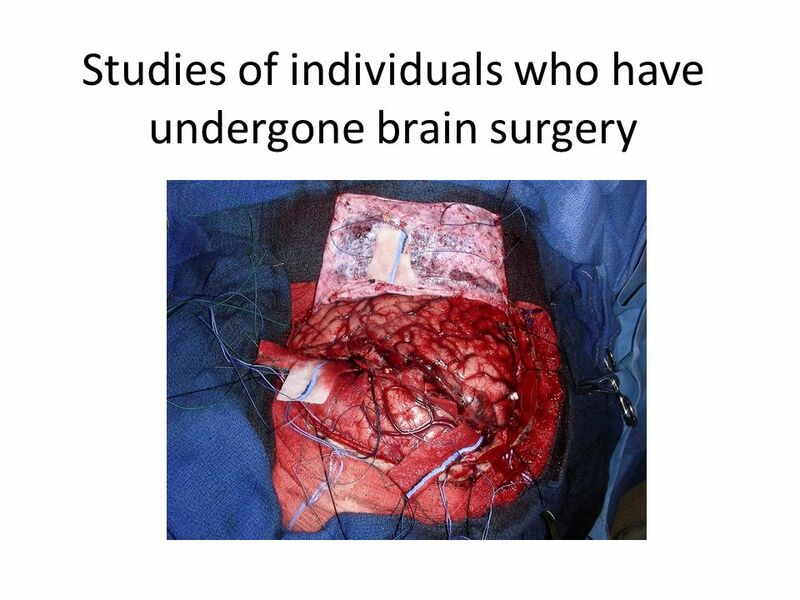 Very common in TBI or stroke patients. 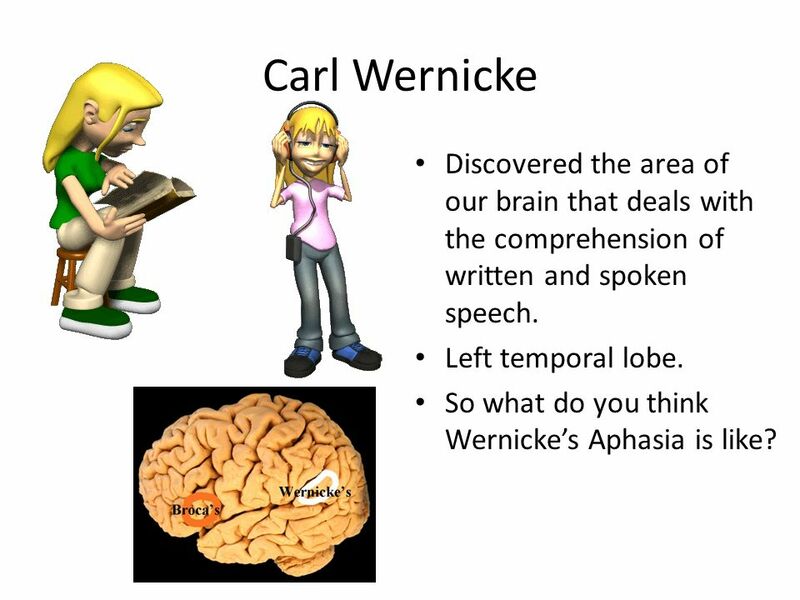 9 Carl Wernicke Discovered the area of our brain that deals with the comprehension of written and spoken speech. Left temporal lobe. So what do you think Wernicke’s Aphasia is like? 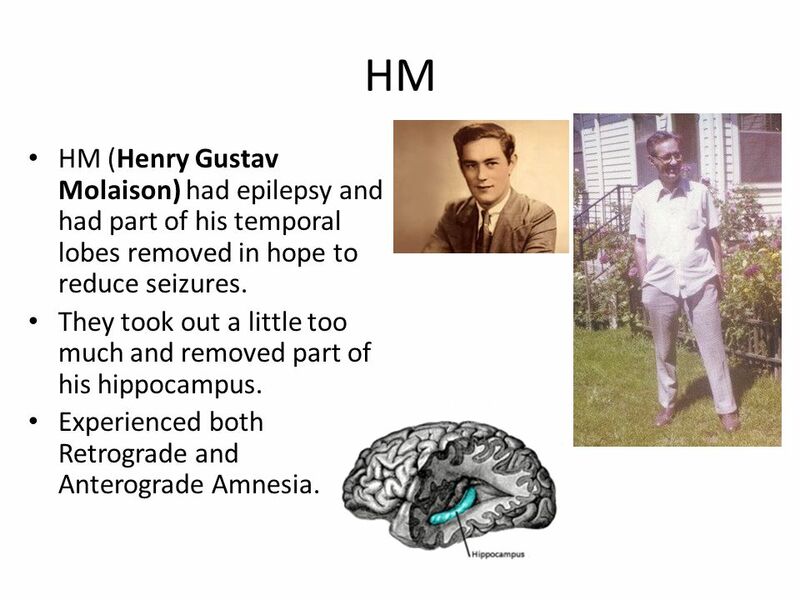 11 HM HM (Henry Gustav Molaison) had epilepsy and had part of his temporal lobes removed in hope to reduce seizures. They took out a little too much and removed part of his hippocampus. Experienced both Retrograde and Anterograde Amnesia. 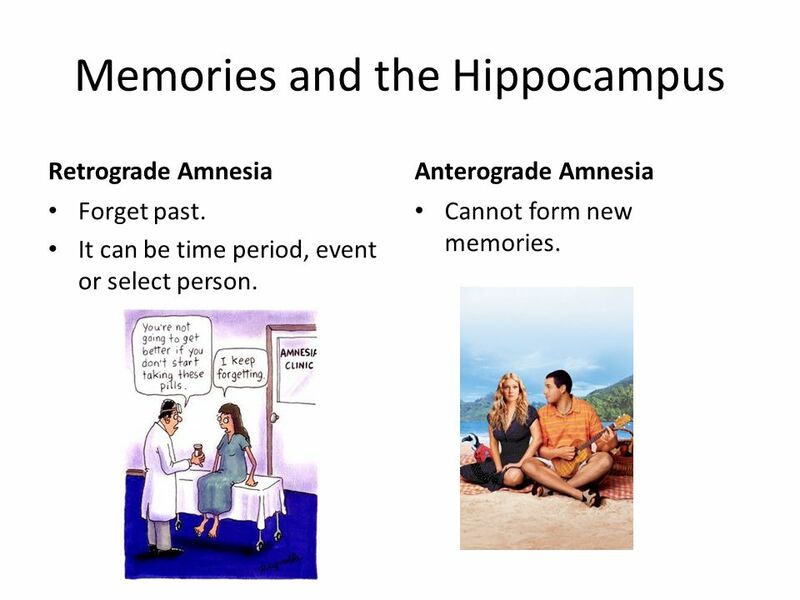 Retrograde Amnesia Anterograde Amnesia Forget past. It can be time period, event or select person. Cannot form new memories. The top of our brain is divided into a left and right hemisphere. Contralateral controlled- left controls right side of body and vice versa. This is called Brain Lateralization. Lefties are better at spatial and creative tasks. Righties are better at logic. Corpus Collosum attaches the two hemispheres of cerebral cortex. 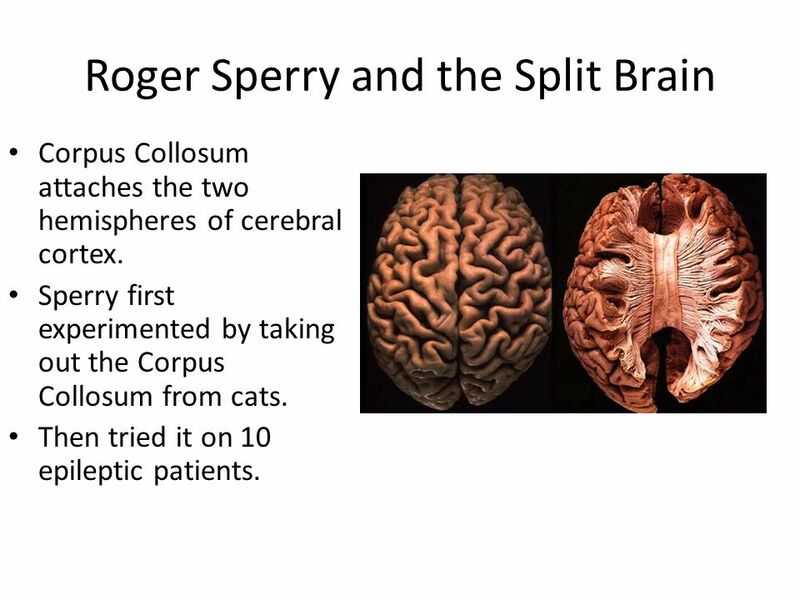 Sperry first experimented by taking out the Corpus Collosum from cats. Then tried it on 10 epileptic patients. 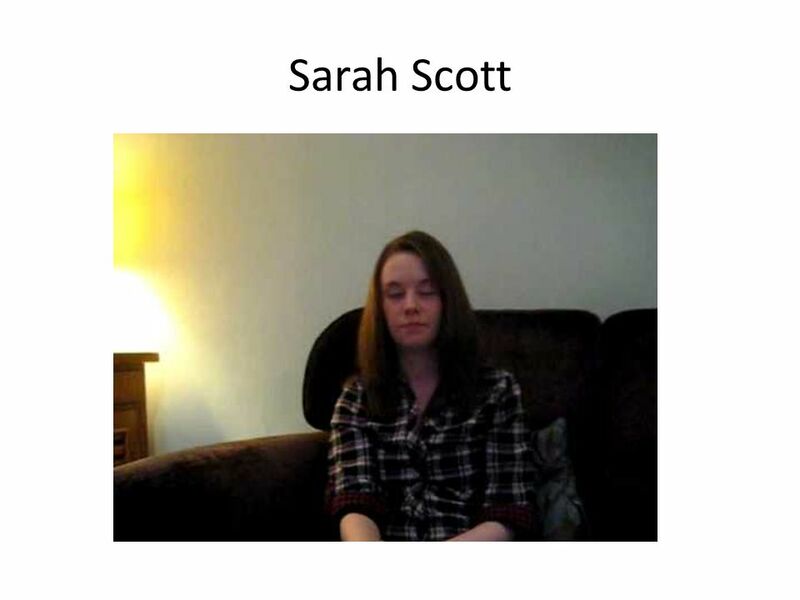 15 They became known as split brain patients. 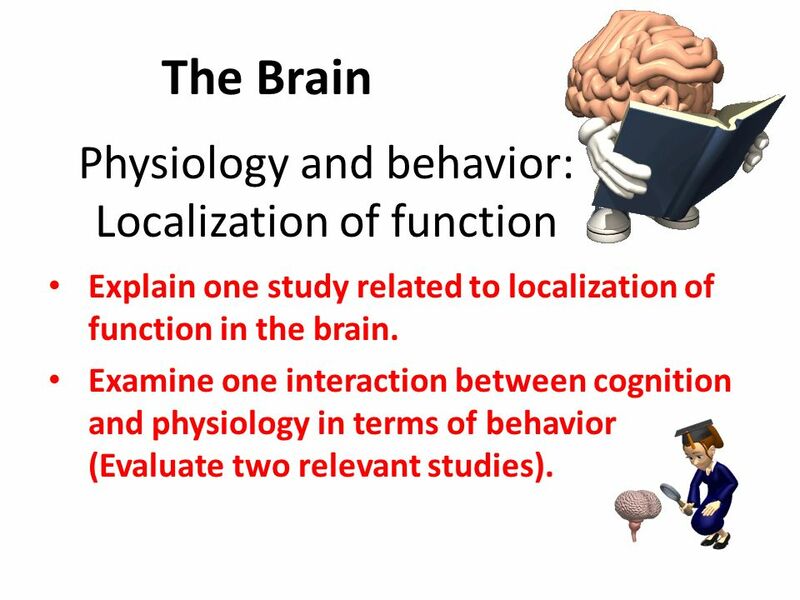 Download ppt "Physiology and behavior: Localization of function"
Specialization of Cerebral Hemispheres Jennifer Chang Konnor George David Flynn Adam Wheller Matthew Slappey. Specialization in the Cerebral Hemispheres Sidney Brunson Blakely Powell Paige Dillenbeck Phillip Skelton Evelyn Peirce. Mapping the Cortex To be human, more does matter. The Brain Module 08. Lower - Level Brain Structures brainstem: oldest, most basic part of brain medulla – controls life-support functions like breathing. The Brain Module 7 Notes. 1.REFLECTION QUESTIONS: Are you left-brained or right-brained? What does this mean? How do you know? Studying The Brain Lesson 6-2. Lateralization of function function or behavior found in only one cerebral hemisphere why might there be lateralization? what are its advantages and disadvantages? Limbic System EMOTIONAL CONTROL CENTER of the brain. Made up of Hypothalamus, Amygdala and Hippocampus. The Brain Made up of neurons and glial cells. Glial cells support neural cells. Your parents are glial cells. They take care of you! 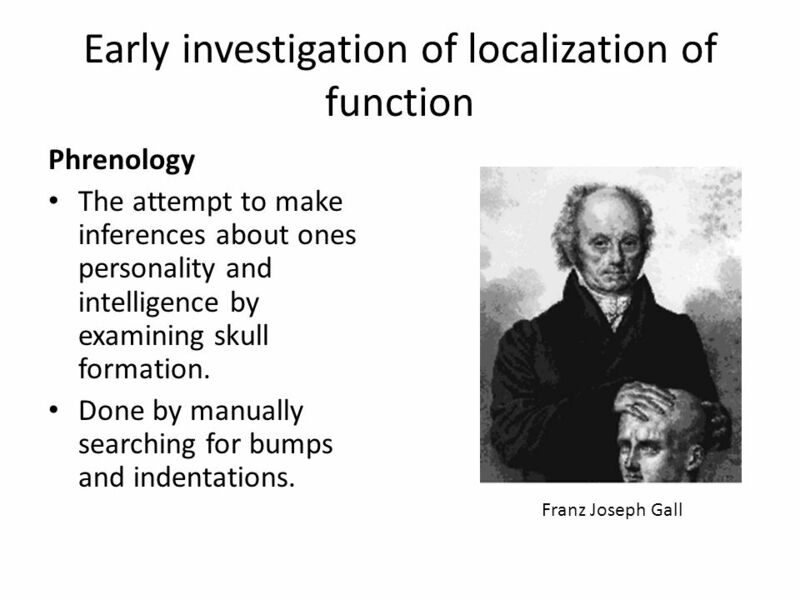 Lateralization & The Split Brain and Cortical Localization of Language. HEMISPHERES, SENSORY AND MOTOR CORTEXES, SPLIT BRAIN, PLASTICITY, ENDOCRINE SYSTEM Chapter 2. 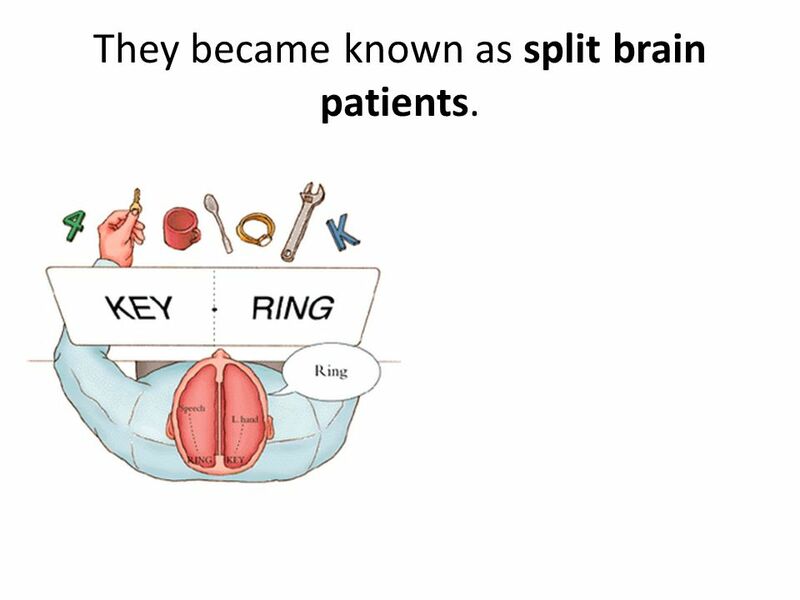 The split Brain How many brains do we actually have? 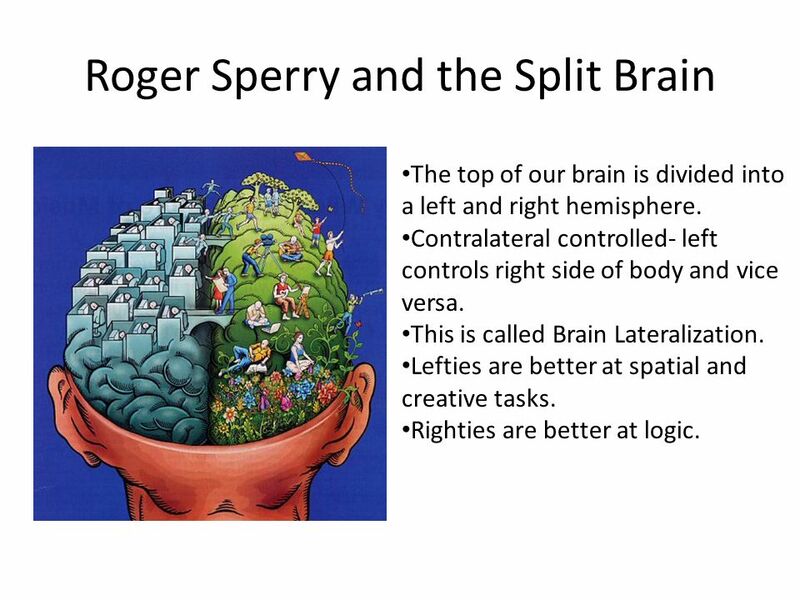 Left and right hemisphere controll different areas of our concious Hemispheres cummunicate using the. “If the human brain were so simple that we could understand it, we would be so simple that we couldn’t” -Emerson Pugh, The Biological Origin of Human Values. Right Hemisphere : Creativity Emotion Art Imagination Spiritual Colorful Musical Spatial relations Patterns Controls left side of body.